Eduard van Beinum was the direct inheritor of the Mahler performance tradition begun in Amsterdam by Willem Mengelberg, friend and champion of the composer; that inheritance is apparent in van Beinum’s liberal use of portamento and rubato, but he is considerably brisker and more direct in manner than his distinguished predecessor. 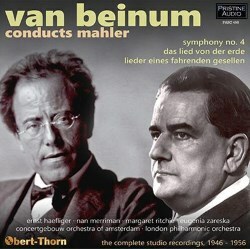 Pristine has performed a typically valuable service for the collector by collating and remastering all the conductor’s Mahler recordings on this double CD issue. The sound is remarkably good throughout, despite being only in mono and the 1946 Lieder eines fahrenden Gesellen being transferred from 78’s rather than LPs. Obviously the second recording from 1956 is easier on the ear but the transfer of that first Mahler recording by Decca is very successful given its era and I derive great pleasure from listening to the whole compilation, barely noticing that it is exclusively monaural. That first Lieder eines fahrenden Gesellen is sung by the Ukrainian mezzo-soprano Eugenia Zareska, a major artist largely forgotten today yet still perhaps familiar to collectors as both Fyodor and Marina in the 1952 studio recording of Boris Godunov conducted by Dobrowen and starring Boris Christoff in all three of the big bass roles. She was a renowned Lieder singer and had a rich, flexible voice. She studied in Vienna, so her German is proficient, even if the occasional vowel is distorted. She demonstrates a particular ability to float piano notes beguilingly; the delicacy of her singing is especially apparent in the quiet section closing “Ging’ heut morgens übers Feld” and throughout “Die zwei blauen Augen”. The second recording, made a decade later with Nan Merriman, a favourite van Beinum singer, is similar, if a little faster; Merriman’s rapid vibrato adds a certain vibrancy to her interpretation but like Zareska, her timbre is ideally suited to the songs, and she too can ‘float a note’. Her diction is sharp and her characterisation winning. Oddly, in both here and in previous issues on other labels, Zareska and Merriman are credited as contraltos, which they were not, although both had pleasingly dark lower registers. In addition to the aforementioned features shared with Mengelberg’s recording, this Mahler’s Fourth Symphony evinces the same sense of insouciant delight in music-making; this is a joyous, affectionate account which simply embraces the high spirits of the symphony, never lingering over detail but mostly rushing headlong into “the heavenly life” – a heaven complete with freshly butchered lambkins and oxen. The chuckling woodwind are slightly raw and the over-riding mood is one of levity, yet the Adagio is serene and the close of the first movement magically still. I have read in reviews elsewhere that van Beinum gives insufficient prominence to the Devil’s fiddle in the second movement, but Andrew Rose’s transfer has lifted the sound to provide excellent balance and clarity. Beloved English soprano Margaret Ritchie sounds rather maternal, even matronly, and she is not always steady, but she enunciates the weird text keenly and expressively and is charming in an old-fashioned way. The recording of Das Lied von der Erde with Nan Merriman was also made in 1956, just before she recorded the Lieder. She is partnered by the distinguished Swiss tenor Ernst Haefliger, who was a student of Julius Patzak, who of course sang with Kathleen Ferrier in their famous 1952 studio recording under Bruno Walter. His secure, attractive voice rides the orchestral textures successfully, rather in the manner of Fritz Wunderlich, another ostensibly lighter voice with surprisingly heroic, penetrative qualities. You can hear that he is just about coping with the cruelly exposed and demandingly high tessitura of the “Ein Affe ist es!” passage, but cope he does. He also captures the lightness of “Von der Jugend” which often escapes the heavier tenors who tackle it. Merriman will inevitably be compared with Ferrier, who also features in the equally recommendable live recording from 1948 with Swedish Heldentenor Set Svanholm, again conducted by Walter and previously released on Pristine (see my review). Her lovely voice lacks something of the plangent richness of Ferrier’s but she is fully up to the vocal demands of the score and invests the texts with great pathos. Of course, “Der Abschied” is the big test. Van Beinum certainly does not rush his singer, here or anywhere else in this cycle, but he follows Walter’s lead in directing one of the swiftest accounts on record; in my collection of twenty or so recordings only Ormandy is faster. The intensity and sonority of the orchestral playing from the Concertgebouw are mesmerising Merriman’s fluttering vibrato might irritate some listeners but it is regular and controlled, and she can fine it away as necessary. The final four minutes are ecstatic, Merriman’s rapt concentration aptly enhanced by the sweep of the strings. Mahlerites and admirers of this conductor have every reason to be grateful to Pristine for assembling this collection and presenting it in the best possible sound.